It’s got to down as one of the greatest goals Mohamed Salah has ever scored in his career. 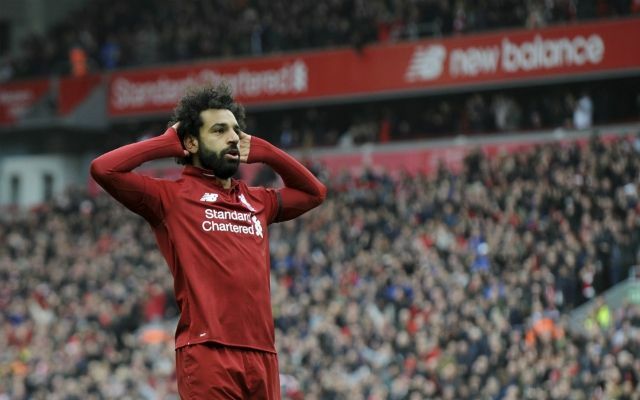 With the Chelsea game falling a day before the 30th anniversary of the Hillsborough tragedy, the Islamophobic chanting from earlier in the week, Salah hunting a goal, and our title challenge on the line, his sublime goal chased away the perfect storm. After our win over Chelsea at Anfield, the Egyptian King revealed everything about the goal to Sky Sports. “I don’t think, I just feel! This one I decided as it was far out I just to go with power and it was a bit lucky the ball hit the net like that!”, Salah admitted with trademark humility. “Henderson did a great job [taking the defender away] and it makes it easier for me. He was part of the goal of course, it’s part of our job in training, we do tactical things and I think it’s working well. Of course Henderson gave him the opportunity to make minimal ground on Emerson, but the skill to pull off a shot like that is incredible. Salah must have set out to teach Chelsea a lesson with all the horrific vitriol he has faced and the vile chants from some of their fans. He shut them up. A picture of serenity and grace with his spiritual pose, how did he have the presence of mind to be so calm after smacking it in from that far out?! The 26-year-old’s analysis of his stunning effort just doesn’t do it justice – it was absolutely amazing and could be a worthy Goal of the Season winner. Jürgen Klopp seemed to think so too as he confessed, “I’ve seen a few really good goals since these boys have been in, I think Steven Gerrard had a few from similar moments.